John Burns was giving evidence at the trial of Rangers supporters' bus driver Callum Phillips. A Rangers fan has told a jury he was thrown through a window after a supporters' bus overturned on a roundabout. John Burns, 63, was giving evidence at the trial of bus driver Callum Phillips, who denies killing a Rangers supporter in a fatal crash. Phillips, 49, is alleged to have caused the death of 39-year-old Ryan Baird by dangerous driving near Kilmarnock, on October 1, 2016. Mr Baird, from Sanquhar, Dumfries-shire, died as he and fellow Rangers fans were travelling to Glasgow for a home match against Partick Thistle. Mr Burns, also from Sanquhar, told the High Court in Glasgow he was taking a six-year-old boy to his first Rangers game. Prosecutor Richard Goddard asked Mr Burns: "Did you notice any difficulty about the driver's style of driving?" He replied: "He seemed to get more erratic as if he was trying to make up time. "He was right up behind cars. I wasn't too happy about the driving, but there wasn't much I could do about it." Mr Burns said at one point the driver had to double back to pick up two passengers. 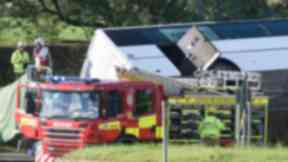 He told the jury he became worried as the coach with 37 passengers on board got to within 20 to 30 yards of the Crossroads Roundabout, south of Kilmarnock. He added: "I said to myself 'no way is this bus going round the roundabout'. It was going too fast to take the roundabout." The witness said that he grabbed hold of the six-year-old boy and held on to him. Mr Burns added: "The bus seemed to swing. "The next thing I remembers is branches of trees hitting the windscreen and I was thrown threw the window on the passenger side." The court was told Mr Burns' back was covered in cuts from broken glass. The boy was not injured. Earlier a 16-year-old boy, who cannot be named for legal reasons, told the jury he was on the Nith Valley Rangers supporters bus when it crashed. He said: "When we approached the roundabout the bus was shaking. The driver was approaching it quite fast. I thought at that speed going round the roundabout was not feasible." The teenager said that the was "a lot of rumbling and shaking" and then the bus hit a lamp post before landing on its side on the banking. Phillips is alleged to have driven the bus at "excessive speed" on roads at Thornhill, Sanquhar and Kirkconnel, Dumfries-shire, New Cumnock, Cumnock and Mauchline. Prosecutors claim he lost control of the bus at Crossroads Roundabout, causing it to skid then strike a kerb, drain cover and a lamp post before coming to rest on its side on the grass verge. Phillips also faces two other charges of driving dangerously at the wheel of a bus. It is alleged he drove dangerously in early 2016 in New Cumnock, East Ayrshire and struck a kerb after approaching a roundabout at speed. He is also accused of driving without due care and attention in August 2016 near Ibrox Stadium by going round a corner at excessive speed. Phillips denies all the charges against him and the trial before Lady Stacey continues.